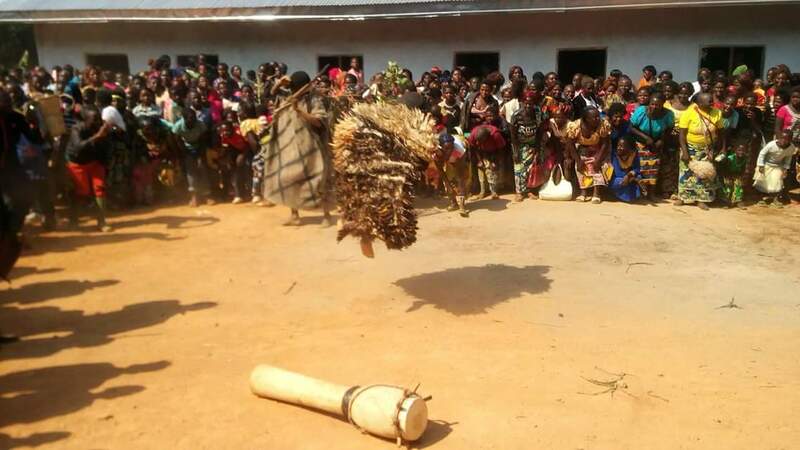 During the year just ending, Cameroon confirmed to the world, within a difficult context, the soundness of its institutions, the resilience of its economy and its attachment to national unity. Indeed, our country demonstrated a remarkable capacity to meet the numerous challenges it faced in the sporting, security, economic or social domains. 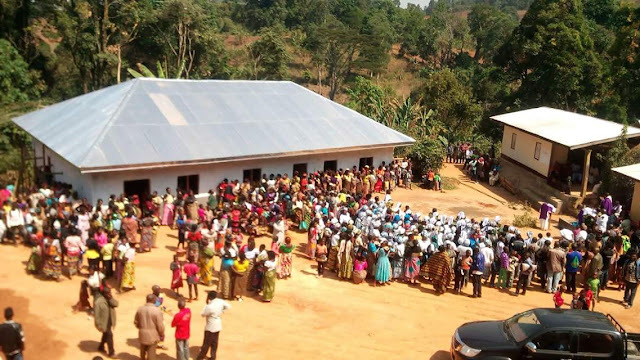 Credit for such accomplishments goes first and foremost to you, the Cameroonian people! 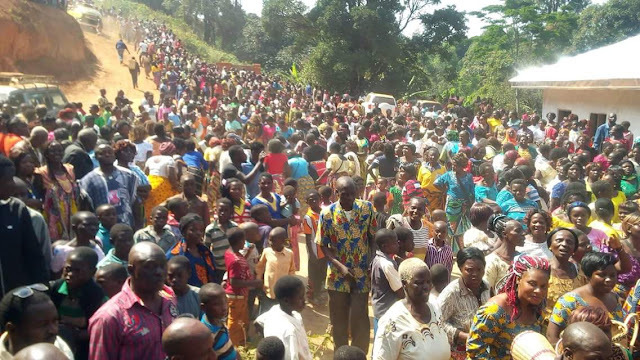 An overwhelming majority of you, whether from the North or South, East or West; whether Anglophone or Francophone, have always demonstrated courage, dynamism, patriotism and, above all, maturity. The adverse global economic situation due notably to falling commodity prices has negatively impacted economic growth and social progress in our country. It has also caused cash flow problems which have severely affected Government contractors, particularly small-and medium-size enterprises. As part of its efforts to address this situation, in June 2017, the Government concluded an economic and financial programme with the International Monetary Fund backed by an “Extended Credit Facility”. This programme is expected to have a positive impact on our growth as from 2018. To this end, we will maintain our efforts to optimize public revenue collection and streamline public spending. Special attention will be paid to the situation of SMEs especially in terms of settling the debt owed them and improving their access to bank loans. We will also maintain our resolve to implement our major projects, with a special focus on road infrastructure. Community outreach services, notably water, electricity and health care will be given special attention. Our country’s health map is getting denser each year, with the construction of about one hundred health centres, subdivisional medical centres and district hospitals. We will continue our efforts to provide quality and universal health care to our population. In this regard, I have instructed the Government to finalize discussions on ways to progressively establish a universal health coverage system. Remarkable progress has been achieved in implementing the projects included in the Three-year Emergency Plan. These are projects which foster true social progress within our communities. Such efforts will be continued. 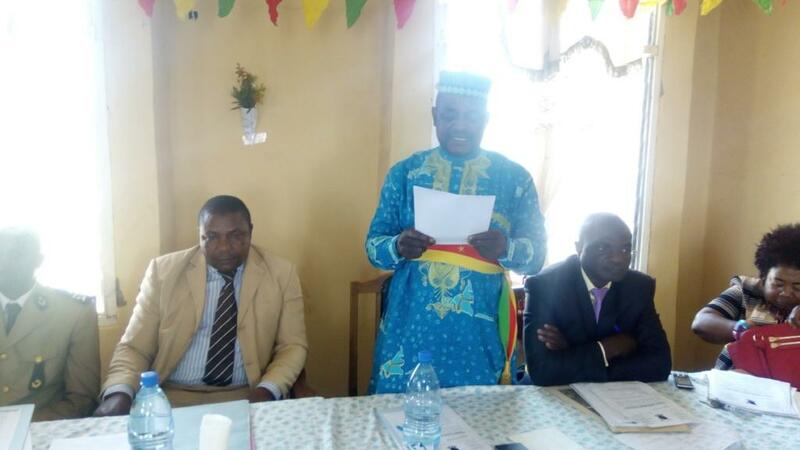 The Government’s sustained action to increase the number of schools and universities make Cameroon a major pool of quality human resources in Africa. Similarly, we will step up our efforts to create jobs, particularly for our youth. In this regard, the completion of major projects such as the Port of Kribi, which will soon go operational, opens up bright prospects. The IMF review mission fielded from October to November 2017 rightly hailed the resilience of our economy and our performance in implementing the programme concluded with this institution. This, you will agree with me, augurs well for our goal of achieving emergence. In the sports domain, the year which is drawing to a close brought us great victories which should be hailed. Our Football Indomitable Lions brilliantly lifted their fifth continental trophy. Our National Women’s Volleyball Team did us proud by emerging as the African Champion right here in Yaounde. On various stadiums worldwide, our flag was raised high and our national anthem resounded thanks to our sportsmen and sportswomen. 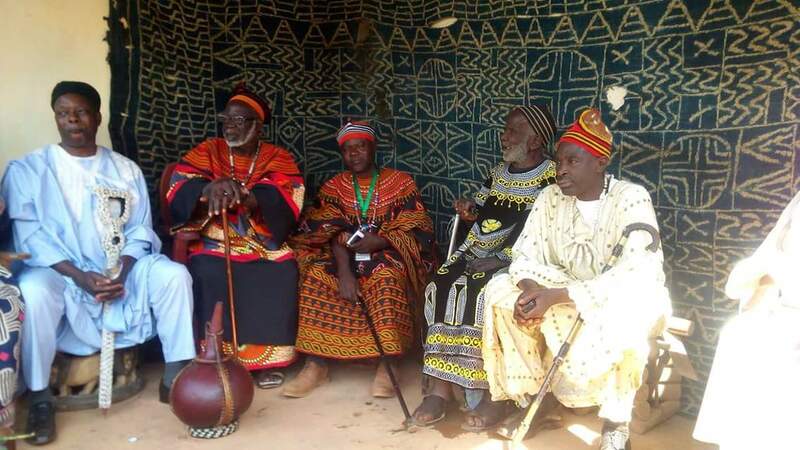 The Cameroonian Nation, through me, extends its hearty congratulations to them. As you are aware, in 2019, our country will host the large continental football family on the occasion of the Africa Cup of Nations. 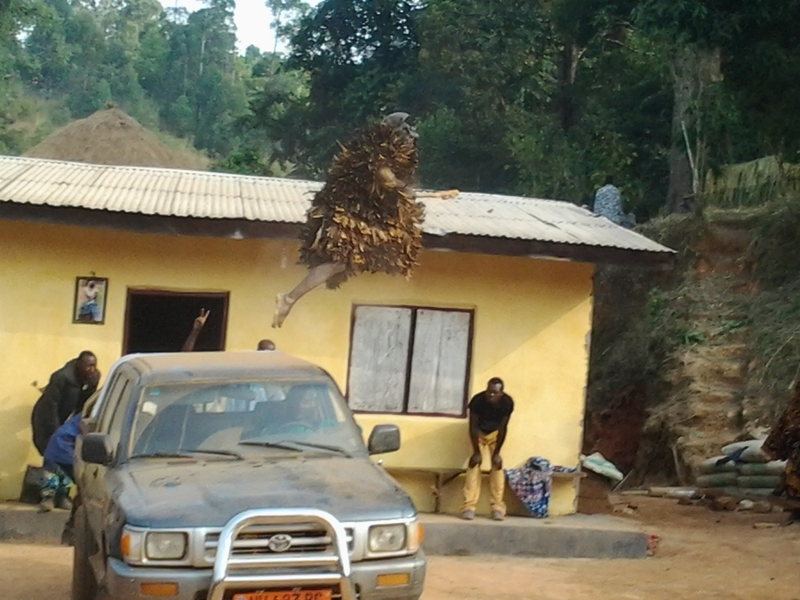 Beyond the purely sporting aspect, this will avail us an opportunity to offer our guests Cameroon’s warm hospitality. I have no doubt that, like our athletes, our population will rise to the occasion and showcase Cameroon at its best. Our country will be ready for this grand celebration of friendship. I have made a commitment to that end. The issue of security was not the least of the challenges Cameroon had to address in 2017. The Boko Haram terrorist sect continued its attacks against our country. Thanks to the bravery of our soldiers and the courage of our population, we inflicted heavy losses on this criminal group and annihilated its expansionist dreams. Definitely, vigilance remains the watchword. In collaboration with our neighbours and international partners, we will sustain our efforts to totally eradicate this terrorist group. We also scored remarkable victories combating hostage-taking on our eastern border. We will step up efforts in that regard, and relentlessly track down the criminal groups involved. 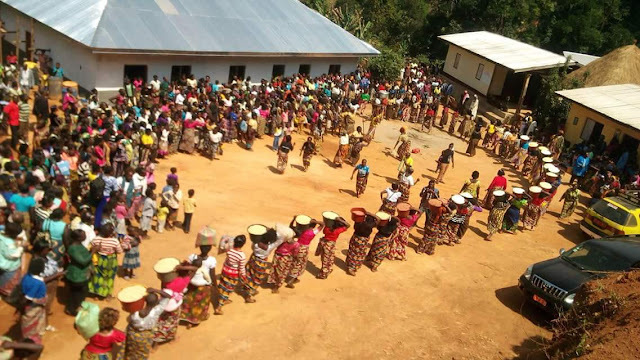 In the North-West and South-West Regions, socio-professional grievances, which the Government nonetheless strove to address adequately, were exploited by extremists seeking to impose their secessionist plans through violence. We all witnessed the seriousness of the spillover. The symbols of the Republic were desecrated. Our children’s education was compromised by criminal arsonists who did not hesitate to burn down schools and attack students. Economic and social activities were disrupted by irresponsible strike calls imposed on the population through threats, intimidation and violence. Bomb attacks were carried out. 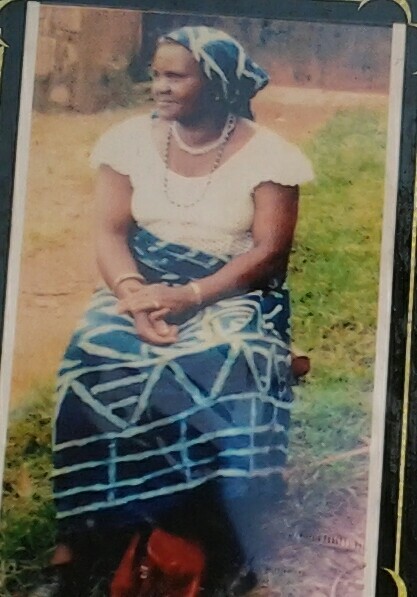 Many of our compatriots lost their lives in violence perpetrated by secessionists. Members of our defence and security forces were assassinated in cold blood in the line of duty. I would like to invite you to spare a thought for all our fellow citizens who lost their lives in this crisis. On behalf of the entire Nation, I would also like to extend our heartfelt condolences to all the bereaved families. As I reminded you recently, it is my duty to ensure republican order, social peace, the unity of the Nation and Cameroon’s integrity. In this regard, I have issued instructions that all those who have taken up arms, who perpetrate or encourage violence should be fought relentlessly and held accountable for their crimes before the courts of law. The security operations conducted to that end have already yielded excellent results. They will continue unabated, but without excesses. I congratulate the defence and security forces on the bravery, determination, restraint and professionalism they have demonstrated thus far. I am aware that the wish of every Cameroonian of good will is to see an end to tensions in the North-West and South-West Regions and a return to normalcy. 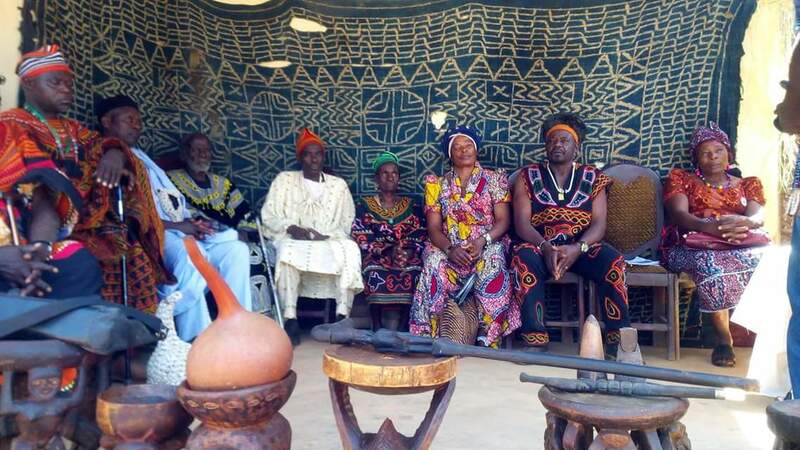 The vast majority of Cameroonians aspire to live together in peace. Bearing in mind this aspiration, I set up the National Commission for the Promotion of Bilingualism and Multiculturalism which will play a key role in promoting our togetherness. It is in the same light that, at the onset of the crisis, I requested the Government to engage in a constructive dialogue with English-speaking teachers and lawyers to seek solutions to their demands. The Government took many actions following the dialogue, even going beyond the initial demands. Others are ongoing or in the pipeline. I should make it very clear that, to my mind, dialogue has always been and will always remain the best means of resolving problems, so long as it is strictly in line with republican legality. My conviction that our fellow citizens desire greater participation in managing their affairs, especially at the local level, has been strengthened by the consultations I have held and the many opinions and suggestions I have received. In this regard, it is my firm belief that fast-tracking our decentralization process will enhance the development of our Regions. To that end, I have ordered the implementation of the necessary measures to speedily give effect to this major reform. In the same vein, the completion of the establishment of the institutions provided for in the Constitution will contribute towards consolidating the rule of law and open a new page in our democratic process. The year 2018 will be an important election year. All necessary measures will be taken to ensure that elections are held in peace and security. As you can see, our Nation is facing multiple challenges which we should address together in fraternity, with due respect for our institutions and in a spirit of national concord. In this light, Cameroon is a precious legacy for each and every one of us. Let us remain worthy of our legacy, of a united Cameroon, standing tall, proud and jealous of its freedom. Ndu Council Adopts a Colossal sum of FCFA 1.077.000.000 (one billion and seventy seven million) as budget for 2018 as against FCFA 860.000.000 in 2017. The councilors adopted the budget based on the council development agenda for 2018. Though doubts have been casted as to whether the huge budget is realistic, Bunyui Emmanuel Nyugap however disclosed that the council is hoping to generate about FCFA 372.760.000 locally while FEICOM will provide FCFA 535.555.425 and PNDP will provide FCFA 54.295.218. 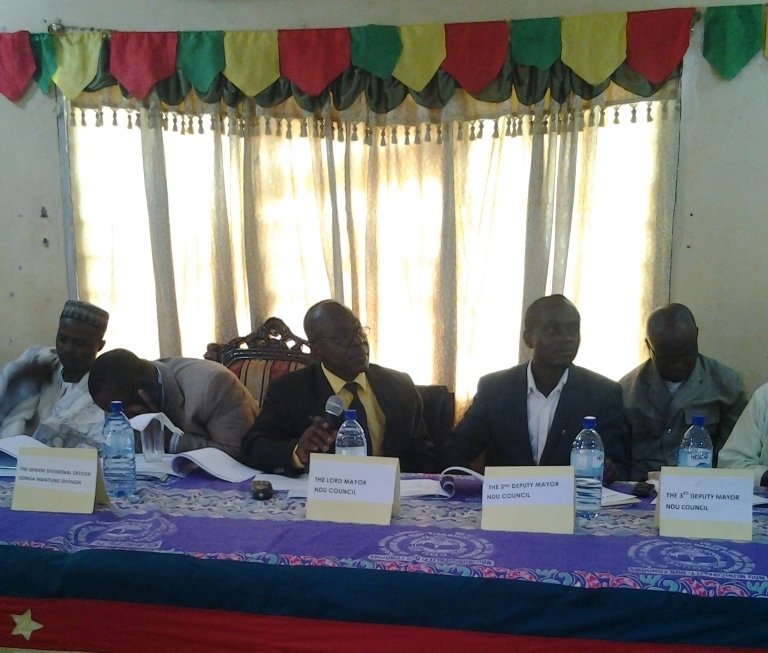 The SDO for Donga Mantung applauded the council for its determination to foster development in the municipality. 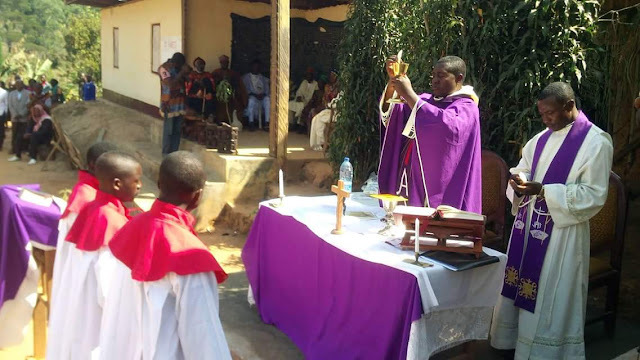 Nkwenti Simon Doh used the opportunity to cautioned especially youths against drug consumption, promiscuity and child labour. He called on the councilors to sensitize the population in order for Ndu not to be the hup for child labour. 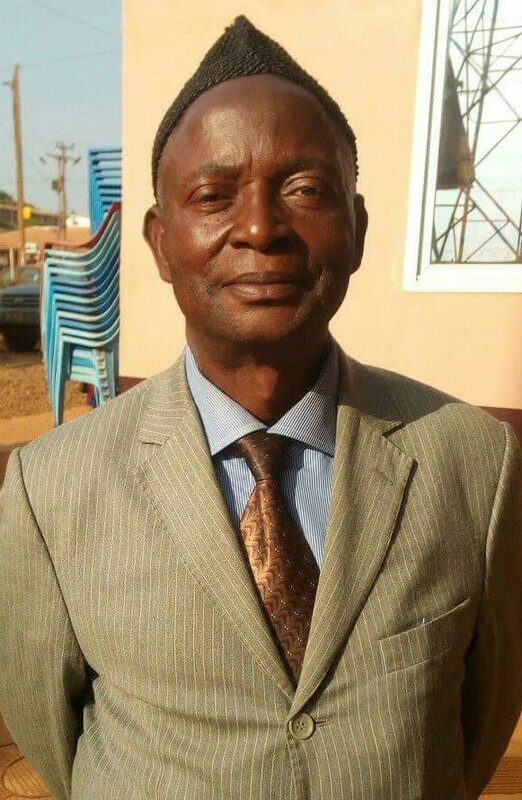 The mayor of Ndu council it is worth mentioning has been very innovative in his actions though several lapses were recorded during this year. Worthy to note that Ndu council was rated the best managed council in Donga Mantung by PNDP and ranked 6th in the North West Region and it is time for the mayor not to lay on his laureate. Though the situation is not that bad in Ndu council, observers say the huge budget may not produce the needed impact given that the basket approach by PNDP to prioritize projects in the municipality is yet to meet the desire of the population as some projects have been rejected by its beneficiaries. This is so because some of the projects realized by the council this year were either abandoned half way or were "poorly executed". Examples abound. The Ndu Park B, constructed beside St. Louis Campus Ndu has been abandoned to goats and sheep. The Mobile Urinary(ies) that have never moved from one spot since 2015 are a fiasco. Furthermore, the plastic tanks (which were allegedly overcharged) did not even improve on access to water in Ndu town. Critical minds have been wondering whether the master of the "Vision Cottage" was able to select from the basket of priorities the needs of the population. 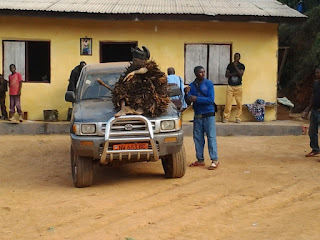 It is worth mentioning that while councilors were deliberating on the budget, a farmer who happened to have been present at the session murmured to himself whether the council could not disburse only 10% of the revenue collected in the various markets to finance a mini agropastoral show when smaller councils like Misaje and Ako have organized agropastoral shows. A glance at priority project reveals another blurt of the Ndu council blunder. It concerns the installation of solar street lamps when the first lamps did not last for three months. In fact, Bunyui Emmanuel hopes to rehabilitate the water system with about FCFA 600.000.000 from FEICOM yet his vision sees only the rehabilitation scheme and the solar pumping station without thinking of how to protect the water catchment. 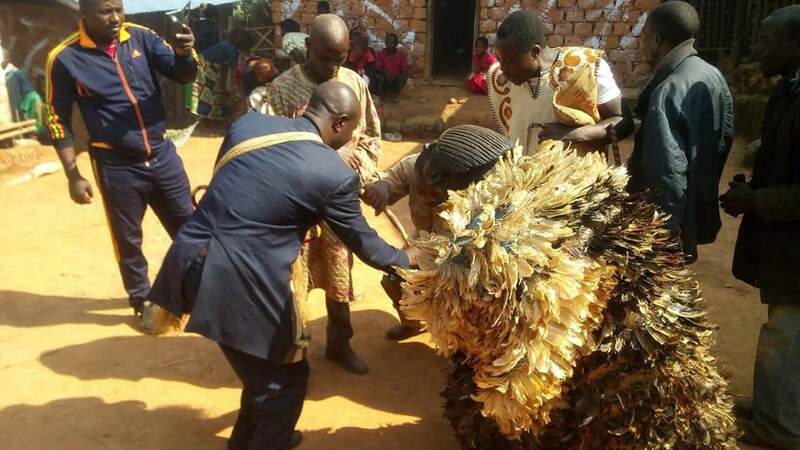 Apparently, with Bunyui Emmanuel, the mayor of Ndu council is dancing " the Bafia dance" when judged from this huge budget. A budget that depends more that 75% on external funders is not sustainable. Why Market B flopped, the solar streets, the plastic tank programme, improving access to potable water, increase usage of market hanger, the standing mobile urinary etc. His being elected has raised hope has the untimely demise of Martin left many wondering whether the council will not go incomatoes. Indicators were already rife at what many had observed due to poor leadership. 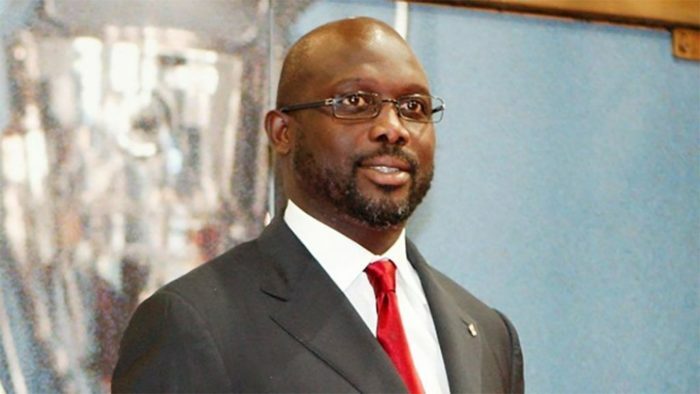 Former world footballer of the year, George Weah might realize his dreams of becoming the President of Liberia come this Christmas. Liberia will hold a delayed presidential run-off vote on December 26 with former soccer star George Weah facing Vice-President Joseph Boakai. Liberian presidential poll was held up for several weeks by a court challenge by the candidate who came third in round one in October, which Weah won with 39 percent of the vote. Weah, a national hero in Liberia, became the first non-European to win European soccer’s player of the year award in 1995, the same year he picked up the African and world player of the year awards. “King George”, as Weah’s supporters call him, is wildly popular among the youth and the disenfranchised, especially in the shanties of the rundown seaside capital Monrovia. Many of them feel they have not benefited from Liberia’s post-war recovery, a sentiment that has counted against Boakai. Weah, 51, has served as a senator from the opposition Congress for Democratic Change since 2015, after returning home from an international soccer career to immerse himself in politics. As a political novice in 2005, he lost to Johnson Sirleaf in a presidential election. Liberians are eager for change after Nobel Peace Prize-winning Sirleaf’s 12-year rule, which sealed a lasting peace in a country that for decades had only known war, but which has failed to tackle corruption or much improve a lot of the poorest. 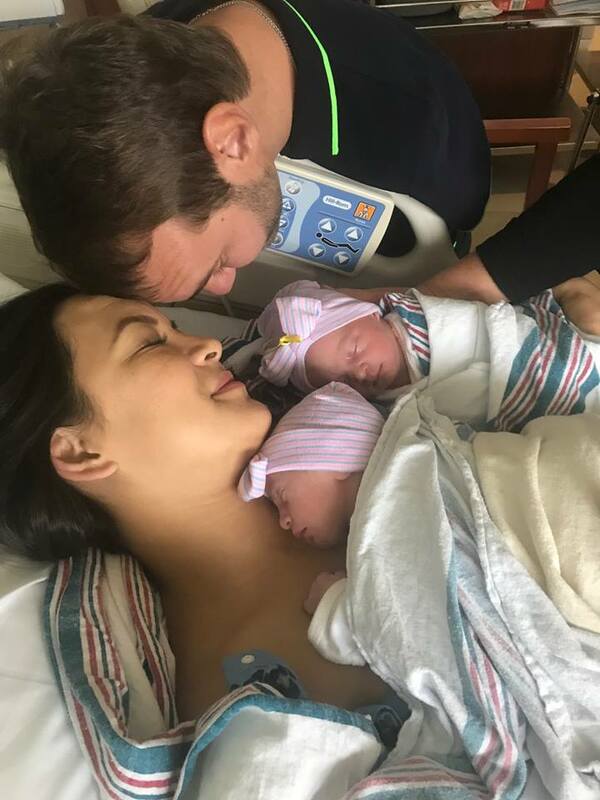 Popular evangelist and motivational speaker Nicholas James Vujicic has been left overjoyed after welcoming two set of identical twins. 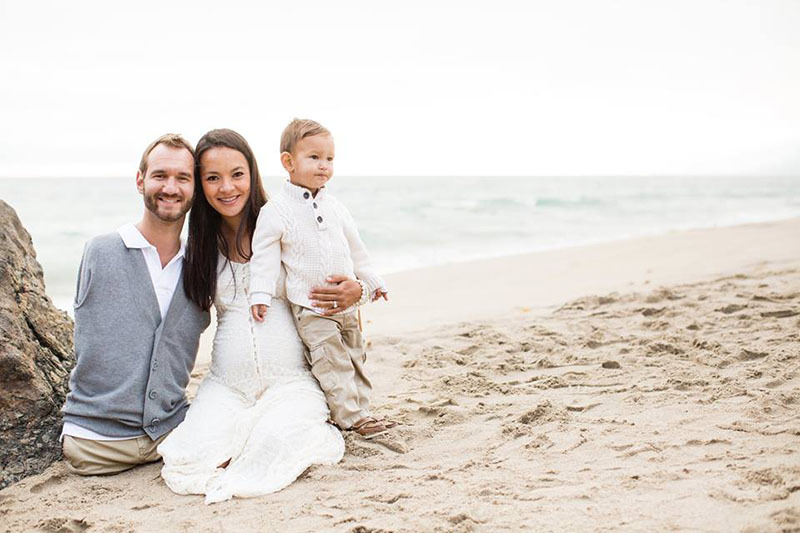 Australian Christian evangelist and motivational speaker Nicholas James Vujicic popularly known as Nick Vujicic and wife Kanae Vujicic welcomed a set of identical twins on December 20. Overjoyed Vujicic took to Facebook to share the story writing: "Our Identical Double Blessing from Our Gracious and Almighty God! 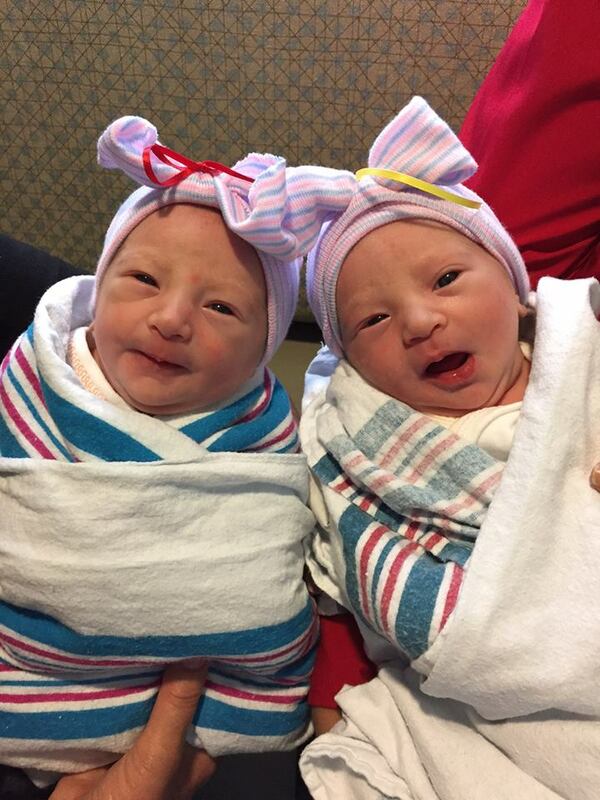 Born Dec 20th - Olivia Mei Vujicic (red bow, 5lbs2oz @ 7:54am) and Ellie Laurel Vujicic (yellow bow, 5lbs14oz @ 7:56am) !!! Mommy (Kanae Vujicic) and Girls doing wonderful." This is the couple's third and fourth child and the medics reported that the babies were both in perfect health. The two married on 12 February 2012 after Kanae came to listen to Nick’s motivational speech in 2008. They now live in southern California. The couple’s firstborn son was born in February 2013 while their second son, Dejan was born in September 2015. Nick who was born with tetra-amelia, a rare disorder characterized by the absence of arms and legs is one of the seven individuals planet-wide who lives with the syndrome. He is the founder of Life Without Limbs and Attitude is Altitude, both which focus on motivational talks and ministry. 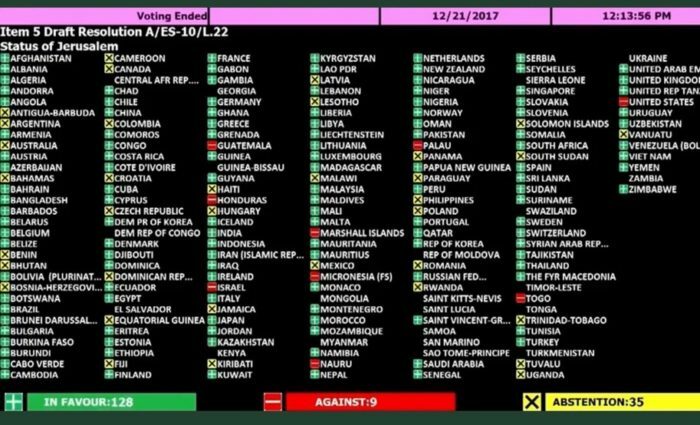 Even after threatening some countries not to vote against his decision, President Donald Trump was defied by 128 UN Members who voted against his recognition of Jerusalem. 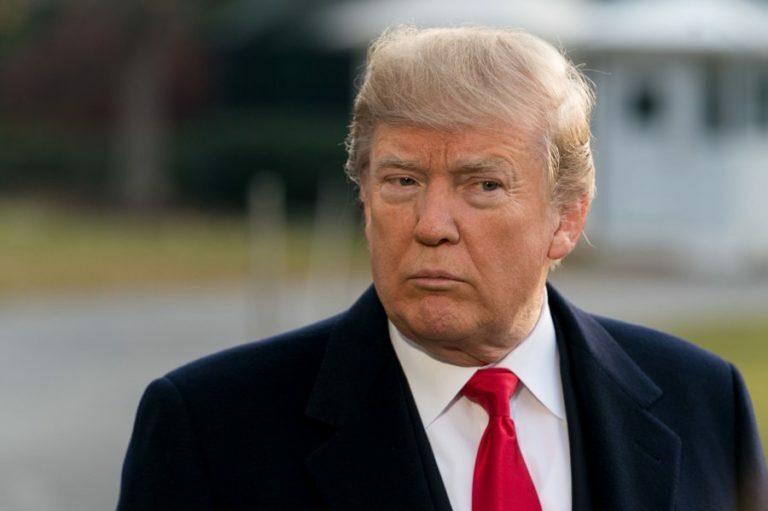 President Donald Trump’s threat to cut off funding to nations that voted at the UN General Assembly against his decision to recognise Jerusalem as Israel’s capital, only swayed about 65 countries. One hundred and twenty eight countries, among them staunch allies of Washington, including Nigeria, defied his bullying threat and voted to reject the move, a stance that Palestinian UN envoy Riyad Mansour called a “massive setback” for the United States. Thirty five countries, among them Rwanda abstained while nine tiny countries, including Togo voted along with US. An additional 21 countries, such as Ukraine, did not show up during voting, perhaps to avoid being on the wrong side against Trump. Guatemala, Honduras, Israel, the Marshall Islands, Micronesia, Nauru, Palau and Togo joined the United States in opposing the measure. Among the countries that abstained were Argentina, Australia, Canada, Croatia, the Czech Republic, Hungary, Latvia, Mexico, the Philippines, Poland, Romania and Rwanda. “America will put our embassy in Jerusalem,” Haley said in defence of the US move, which broke with international consensus and unleashed protests across the Muslim world. “No vote in the United Nations will make any difference on that,” Haley said. “When we make generous contributions to the UN we also have a legitimate expectation that our goodwill is recognized and respected,” she said. The resolution reaffirms that the status of Jerusalem must be resolved through negotiations, and that any decision reached outside of that framework must be rescinded. The motion was sent to the General Assembly after it was vetoed by the United States at the Security Council on Monday, although all other 14 council members voted in favour. “No General Assembly resolution will ever drive us from Jerusalem,” vowed Danny Danon, Israel’s envoy to the United Nations. Trump’s decision on December 6 to recognize Jerusalem as Israel’s capital prompted a flurry of appeals to the United Nations. The status of the Holy City is one of the thorniest issues in the Israeli-Palestinian conflict, with both sides claiming it as their capital. Trump warned that Washington would closely watch how nations voted, suggesting, like Haley, there could be financial reprisals for those that back the motion put forward by Yemen and Turkey on behalf of Arab and Muslim countries. “They take hundreds of millions of dollars and even billions of dollars and then they vote against us,” Trump said at the White House. The resolution mirrored the text that was vetoed at the Security Council on Monday, and although it does not mention Trump’s decision, it expresses “deep regret at recent decisions” concerning the city’s status. No country has veto powers in the General Assembly, unlike in the 15-member Security Council where the United States, along with Britain, China, France and Russia, can block any resolution. Among the 14 countries voting in favor on Monday were Britain, France, Italy and Japan and they did so again on Thursday. Ukraine, which supported the draft resolution in the Security Council, was among 21 countries that did not turn up for Thursday’s vote. Several UN resolutions call on Israel to withdraw from territory seized in 1967 and the draft resolution contains the same language as past motions adopted by the assembly. The Portuguese picked up his fifth Ballon d'Or award recently and claimed he is the finest footballer to have lived. But it's simply not the case. Self-belief is important for any top-level sports star. It is fair to say that Cristiano Ronaldo has plenty of it and after claiming a fifth Ballon d'Or in early December, the Real Madrid forward declared himself to be the best player in the history of football. “I’m the best player in history, in the good moments and the bad ones,” he told France Football , the magazine that organises the award. “I respect everyone’s preferences, but I’ve never seen anyone better than me. I have always thought that. "No footballer can do the things I can. There’s no player more complete than me. I play well with both feet, I’m quick, powerful, good with the head, I score goals, I make assists. There are guys who prefer Neymar or [Lionel] Messi. But I tell you: there’s no-one more complete than me." It is that attitude that has pushed the Portuguese to greater heights. Certainly, his admirable ambition has changed his life and that of his entire family, while it has helped Real Madrid to three Champions League crowns over the past four seasons. But he is not the best player in history. In fact, he is probably not even the finest footballer to have played for Real Madrid. When Goal spoke to fans outside the Santiago Bernabeu recently, not many picked Ronaldo as the best to have turned out for their club , though all of them did admit that he is among the finest to have pulled on the famous white shirt. Cristiano has more goals than Alfredo Di Stefano, considered by many to be Madrid's greatest, but the Argentine great led Los Blancos to five European Cups in the late 1950s and early 1960s and is still highly rated by many. "It would be unfair of us if we forgot players like Di Stefano, who is one of the greats not only at Real Madrid, but in football," former Madrid goalkeeper Paco Buyo told Goal recently when asked if Ronaldo was the best ever at the club. "I think Cristiano is a true Real Madrid legend for everything he has achieved, but I think it is difficult to say he is the best player to have passed through the club." And ex Boca Juniors, River Plate and Argentina goalkeeper Hugo Gatti, who played against Di Stefano, told Goal: "He was the best. For me, after Pele, who was the best in the world, the best in history, Alfredo comes next. So the comparison with Cristiano is difficult." Another Argentine, Diego Maradona, is often mentioned among the game's greatest players and when told in an interview that Cristiano considered himself to be the best ever, the 57-year-old replied: "Tell him to stop taking the p*ss!" When subsequently asked where he would be in the list if Ronaldo was the best, he said: "Exactly! That's why I tell him to stop taking the p*ss!" And pressed on the greatest he had seen, the World Cup winner added: "From the little that I saw, Alfredo Di Stefano, [Johan] Cruyff and [Lionel] Messi. Cristiano could be up there too." In terms of goals, he is. The Portuguese has hit 422 in 415 appearances for Real Madrid, with over 545 strikes in his club career and a record 79 (in 147 matches) for his national side. Football has seen many great goalscorers throughout the years; Jimmy Greaves, Telmo Zarra, Just Fontaine and Gerd Muller among them. However, those names are seldom mentioned among the best players in history. Manchester City right-back Danilo played with Ronaldo for two seasons at Real Madrid, but said in an interview with Goal : "I always tell my friends there are three players I've seen do otherworldly things in training: Neymar, Isco and Marcelo." And asked about Ronaldo, he replied: "Oh... Cristiano is a player that wants to score goals, he's a numbers, results guy, it's a little bit different." Ronaldo's record of 79 goals for Portugal makes him his nation's top scorer. However, many Portuguese still believe Eusebio (who passed away in 2014) to be the country's best-ever player. The Benfica great, who netted 733 goals in 745 matches in a spectacular career, hit 41 in 64 games for Portugal. Ronaldo, meanwhile, took 106 matches to surpass that figure as he reached 43 strikes with a hat-trick against Northern Ireland in 2013. “I am saddened because we can’t make that comparison," Eusebio said on Portuguese television when he was surpassed by Cristiano in 2013. "It’s a mistake because I played (around) 60 matches to score that amount (41 goals). “Now, after all these years, someone else scores (that many goals) but obviously that happens because today it is easier to play some of these teams. I never got to play against Liechtenstein or Azerbaijan." Ronaldo, of course, has since helped Portugal to victory at Euro 2016, although even that win came after he limped off in the final against France. In any case, while he was named the best Portuguese player of all time by the nation's football federation (FPF) in 2015, he cannot be considered the finest footballer of his generation. Because that honour belongs to Messi. Although both men are now tied on five Ballons d'Or apiece, the only variable by which the two can really be compared is in their goals. In that respect, it is fairly even. But in every other facet of the game, be it passing, dribbling, vision or creating chances, the Argentine is far superior. “The Ballon d’Or thing is a little tiresome because it has been moved to a different playing field,” Dani Alves told Goal back in 2014 . “It has moved to the field of opinions and off the field of play. But if we look at the field of play, I think Leo, for as long as he is around, will push the rest into second place. “Moving away from that, perhaps he has less chance. The winner is often the one who has had the best campaign, or the best publicity campaign." Ronaldo has more than that. The Portuguese was decisive last season as Real Madrid retained the Champions League, scoring 10 goals from the quarter-finals onwards as Los Blancos beat Bayern Munich, Atletico and Juventus to win their 12th European Cup. However, Alves was right in that Messi is better. Since Ronaldo's arrival at Real in 2009, the Argentine has a superior scoring record and he hit an unprecedented 91 goals for club and country in 2012. Even playing often in a deeper role, the 30-year-old has outscored the Portuguese so far in La Liga in 2017-18 (although Cristiano is ahead in Europe) and he contributes much more to his side's overall play. Ronaldo, meanwhile, is something of a goal hanger these days, a player who shoots on sight. This season, the 32-year-old averages more than six shots per game in La Liga, with as many as 12 in the 1-0 loss to Betis. He shoots much more than Messi at Barca, for example, which helps him to score as many as he does. And although he has also racked up a fair number of assists, that is partly due to his proximity to the goal. Rarely does he beat several players and find a team-mate or produce the kind of defence-splitting passes that Messi does. Madrid coach Zinedine Zidane was asked recently if he believed Ronaldo was the best in history and said: "Yes. There are lots of players who have been very successful in this club, but no one has achieved what he has, and what he's still going to achieve." However, any Real boss knows he will need to praise the Portuguese to stay in his good books. During his time at the Santiago Bernabeu, Jose Mourinho often hailed his compatriot, but changed his tune last year when he said: "For me the top three players in history are Messi, Pele and Maradona." Messi is often mentioned in the same breath as those two South American legends, while Ronaldo has fought to compete with the brilliant Barcelona forward in this era. And the fact he has levelled the Argentine on five Ballons d'Or is testament to his extraordinary drive and dedication to be the best he can. Cristiano will definitely go down as one of the game's greats and deservedly so. But he is not the best player in the world right now - however many Ballons d'Ors he wins - and he is certainly not the finest footballer in history. The United Nation's General Assembly in a unanimous decision has rejected US recognition of Jerusalem as capital of Israel. Nothing is so electrifying than to present a rising musical star. Let me introduce you to Dolly Pearl a talented artist who is shooting the stars in 2017. That said, if you are hoping for a big show, Dolly Pearl is the latest name in the game. 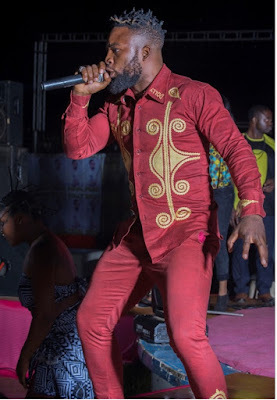 In fact, those who have had the opportunity to see him perform live shows or seen any of his live stage performances would agree that he is the Afrobeat lavender in the music industry. Known by his real names as Ataindum Donald Nge, (Dolly Pearl), he is the new name in every household. In fact, he is as described by impressionists, a bulk of talent and symbol of Afrobeat. What is so peculiar about him is that he draws his inspiration from practical happenings around him. And most of his songs are just soul touching and full of emotions. 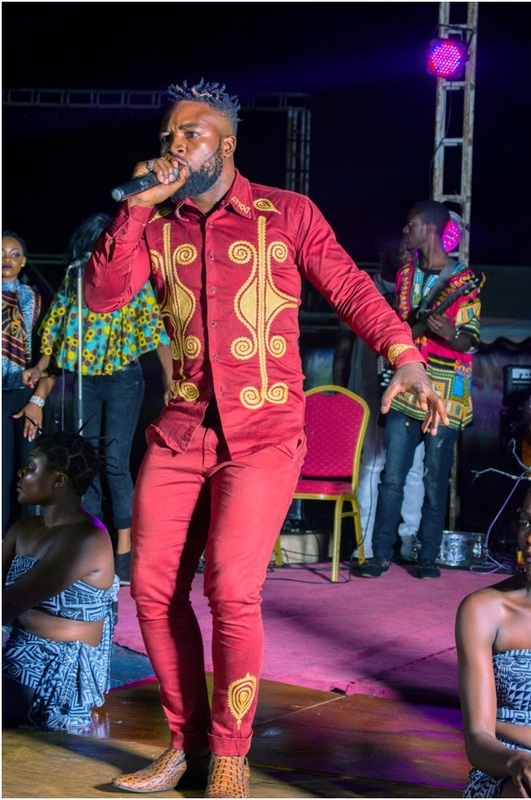 The young artist who hails from the West African city of Bamenda is a rising Afrobeat artist to look out for. 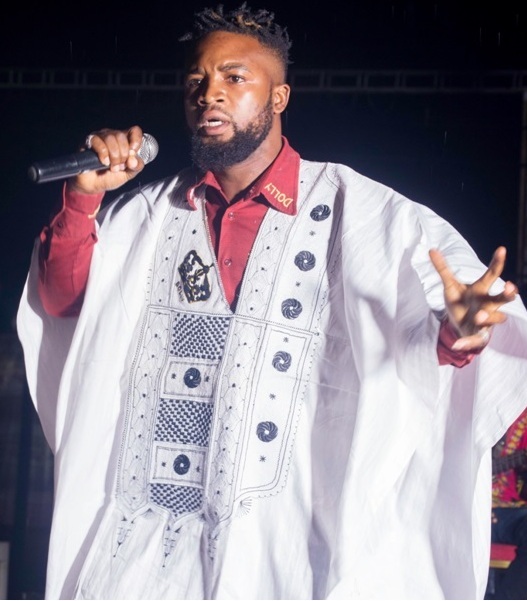 So far, Dolly Pear is known for his organic ability to write and compose highly melodious Afrobeat songs that inspire various instrumentalists, who have worked with him during live studio recordings and live stage performances. Dolly Pearl cut his teeth in the music industry in 2014, when he independently recorded and digitally released his debut single titled Yere Dance, which received positive reviews. Pikin”, was the first song.The song Carrefour Pikin is based on Dolly’s real life experiences as a hustler, trading on the streets, indulging in brick laying and farming for survival.Carrefour Pikin, instantly generated a huge following especially on social media platforms like Youtube, Sound Cloud, etc. Dolly and Nyambi worked on several other Afrobeat songs and eventually, Dolly got introduced to creative entrepreneur Armstrong Fombi, who stressed on the need to market Dolly as a live music stage artist. This led to the conception of Dolly’s first ever live music gig titled; THE DOLLY PEARL CONCERT, wholly financed by Dolly himself and produced by DAZFOMBI, a subsidiary of FOMBILLION. Prior to the concert, the WUL’IBALI ORCHESTRA was created as Dolly’s band, widely known as DOLLY PEARL&THE WUL’IBALI ORCHESTRA. The concert gave Dolly Pearl very significant exposure and established him as the AFROBEAT PRINCE. Musically speaking, Dolly Pearl moves in between the polished and structured, and the edgy and audaciously bold sounds of Afrobeat music. His meticulous hub on the romantic bubble of his songs, combined with his talented vocal, has resulted in his music being greatest source of inspiration to many. . It is worth noting that THE DOLLY PEARL CONCERT, which held on Saturday November 4th, 2017, at the Blue Pear Hotel Plaza in Bamenda, became the first 100% live music concert in Bamenda, since 1997. From Dolly’s impressive portfolio of Afrobeat songs, one can clearly perceive the AFROBEAT PRINCE as an activist, judging from the bluntness with which he addresses various socio-cultural, economic and political issues in most of his songs. 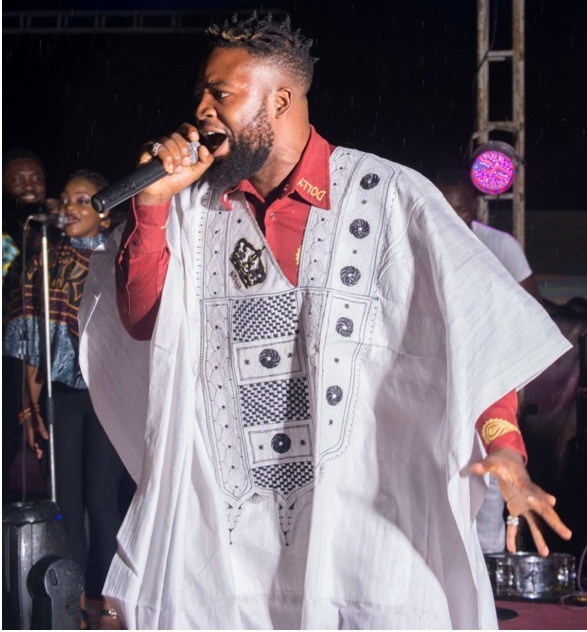 Having found his clear path in the music business as a live music stage artist, Dolly is busy creating more and more highly melodious Afrobeat songs with his hit producer Edwin Nyambi, while looking forward to performing live with his band THE WUL’IBALI ORCHESTRA, on various platforms across the world. New York, December 13, 2017—For the second year in a row, the number of journalists imprisoned for their work hit a historical high, as the U.S. and other Western powers failed to pressure the world’s worst jailers--Turkey, China, and Egypt--into improving the bleak climate for press freedom, the Committee to Protect Journalists found. As of December 1, 2017, CPJ found 262 journalists behind bars around the world in relation to their work, an increase on last year’s historical high of 259. Turkey is again the worst jailer, with 73 journalists imprisoned for their work as the country continues its press freedom crackdown. China and Egypt again take the second and third spot, with 41 and 20 cases respectively. The worst three jailers are responsible for jailing 134--or 51 percent--of the total. According to CPJ’s census 194 journalists, or 74 percent, are imprisoned on anti-state charges, many under broad or vague terror laws. In Turkey, every journalist on the census is either accused of or charged with anti-state crimes. Although many journalists cover multiple beats, politics was the most dangerous, covered by 87 percent of those jailed. Nearly all the jailed journalists are local and the percentage of freelancers is higher this year, accounting for 29 percent of cases. Other leading jailers of journalists in 2017 are Eritrea, with 15 cases, and Azerbaijan and Vietnam, with 10 cases each. 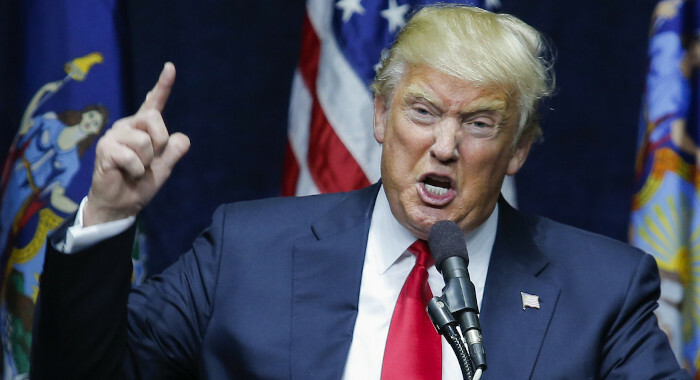 The international community has done little to isolate repressive countries and U.S. President Donald Trump’s nationalistic rhetoric and insistence on labeling critical media “fake news” serves to reinforce the framework of accusations and legal charges that allow such leaders to preside over the jailing of journalists. CPJ’s 2017 census found the number of journalists jailed for “false news” doubled this year, to 21 cases. Poor prison conditions is another issue this year, with two journalists jailed in China, including Nobel laureate Liu Xiaobo, dying just weeks after being released on medical parole, and several others seriously ill. In Egypt, CPJ found over half of the jailed journalists have health conditions. The prison census accounts only for journalists in government custody and does not include those who have disappeared or are held captive by non-state groups, such as several Yemeni journalists CPJ believes to be held by the Ansar Allah movement, known as the Houthis. These cases are classified as “missing” or “abducted.” CPJ has been conducting an annual survey of journalists in jail since the early 1990s. CPJ’s list is a snapshot of those incarcerated at 12:01 a.m. on December 1, 2017. It does not include the many journalists imprisoned and released throughout the year; accounts of those cases can be found at https://cpj.org. Journalists remain on CPJ’s list until the organization determines with reasonable certainty that they have been released or have died in custody. American superstar, Robyn Rihanna Fenty who is a Barbadian singer, songwriter, and actress appears to be in love again, but this time with a billionaire from the Middle-east. Rihanna set tongues-wagging last week after she was spotted with an eye-catching diamond ring on her wedding finger. And as speculation mounts, Rihanna cut a stylish figure as she jetted into London alongside her beau, Hassan Jameel on Monday. The 29-year-old hitmaker donned a warmth-inducing red, white and navy print coat as she walked through Heathrow Airport with her Saudi Arabian boyfriend. The 'Work' singer teamed her horse patterned jacket with a pair of skintight leggings which highlighted her slender pins. Ready to combat the chilly temperatures, she placed a thick black scarf over her neck while she donned a pair of shades while walking through the terminal. It has been revealed that as many as 260 journalists are currently in detention worldwide. According to reports published by the the press freedom arbiter, Committee to Protect Journalists, on this year’s database of journalists Imprisoned worldwide, indicators are showing a rise in cases of journalists jailed on account of their work. The report released on Wednesday said the number of journalists imprisoned for their work hit a “historical high” for the second year in a row. “As of December 1, 2017, CPJ found 262 journalists behind bars around the world in relation to their work, an increase on last year’s historical high of 259,” the statement noted. The world’s worst jailers of journalists, according to the report, are the trio of Turkey, China and Egypt – carrying on the baton from last year. CPJ decried that the U.S. and other Western powers have failed to pressure the three countries to improve “the bleak climate for press freedom”. 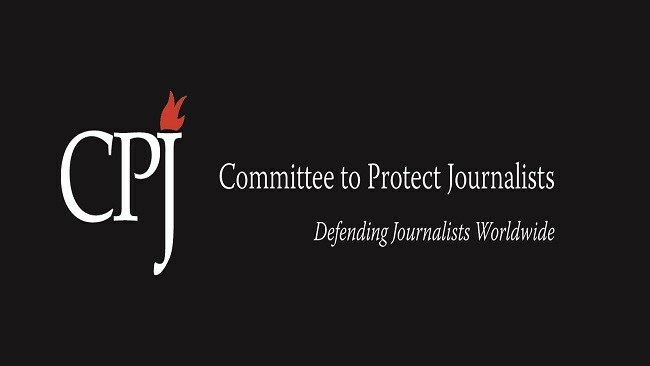 “In a just society, no journalist should ever be imprisoned for their work and reporting critically, but 262 are paying that price,” said CPJ Executive Director, Joel Simon. According to CPJ’s census 194 journalists, or 74 per cent, are imprisoned on anti-state charges, many under broad or vague terror laws. In Turkey, every journalist on the census is either accused of or charged with anti-state crimes. Although many journalists cover multiple beats, politics was the most dangerous, covered by 87 percent of those jailed. Nearly all the jailed journalists are local and the percentage of freelancers is higher this year, accounting for 29 per cent of cases. “The international community has done little to isolate repressive countries and U.S. President Donald Trump’s nationalistic rhetoric and insistence on labeling critical media “fake news” serves to reinforce the framework of accusations and legal charges that allow such leaders to preside over the jailing of journalists. “CPJ’s 2017 census found the number of journalists jailed for “false news” doubled this year, to 21 cases,” the report added. Muslim countries have gathered in Turkey's capital, Istanbul to forge a reach an agreement on how to counter Donald Trump's recognition of Jerusalem as capital of Israel. Leaders and senior officials from Muslim countries are expected to hold an extraordinary summit Wednesday in Istanbul, Turkey to forge a consensus to a U.S. decision to recognise Jerusalem as the Israeli capital. Turkish President Recep Tayyip Erdogan called for the extraordinary session of the Organization of Islamic Cooperation (OIC) as the organization’s term-president to produce a unified Islamic position. The Turkish leader has been one of the most outspoken critics of U.S. President Donald Trump’s decision which also includes starting immediately the process of moving the U.S. embassy from Tel Aviv to Jerusalem. “Declaring it (Jerusalem) as a capital and relocating the (U.S.) embassy has no validity for us,” Erdogan has said. Israel took over East Jerusalem, revered by Muslims as the third holiest site in Islam, in the 1967 war, and declared unilaterally the whole city as its eternal capital. However, this move has never been accepted by the international community, which has called for reaching a final settlement of the dispute through Israeli-Palestinian peace talks. Turkish Foreign Minister Mevlut Cavusoglu on Tuesday criticized some Arab countries for “refraining from challenging Trump,” noting that the OIC summit is seeking recognition of the State of Palestine with East Jerusalem as its capital. Most OIC members are expected to attend, including the Palestinian president, the Iranian president, the Lebanese president and the Jordanian king. Prior to the summit, the Turkish president met on Tuesday with Palestinian President Mahmoud Abbas in Istanbul. The closed-door meeting lasted for one hour, and no statement was made thereafter, according to Turkish media. The OIC is the second largest inter-governmental organization after the United Nations with a membership of 57 states spread over four continents. Trump’s announcement over the contested city has sparked days of violent clashes in Gaza Strip and West Bank as well as protests in other Arab countries. Several rockets were fired from Gaza into Israel over the past few days. According to a health official in Gaza, clashes between Palestinian young protestors and Israeli soldiers continued on Tuesday at the border areas between Gaza and Israel, with five moderately injured by live bullets so far. A text-message in which a veteran FBI agent was caught calling President Donald Trump an idiot has been made public. An FBI agent removed from special counsel Robert Mueller’s investigative team over politically charged text messages referred to Donald Trump, then the Republican presidential candidate, as an “idiot” and said on election night that a Trump victory would be “terrifying,” according to dozens of text messages reviewed by The Associated Press. Peter Strzok, a veteran FBI counterintelligence agent who was also deeply involved in the investigation into Democrat Hillary Clinton’s use of a private email server, was removed over the summer from Mueller’s team following the discovery of text messages exchanged with Lisa Page, an FBI lawyer who was also detailed to the group of agents and prosecutors investigating potential coordination between Russia and the Trump campaign. The messages, which surfaced in a Justice Department inspector general investigation into the FBI’s handling of the Clinton inquiry, were being provided to congressional committees and were reviewed by the AP on Tuesday night. The texts seen by the AP occurred as the 2016 presidential race was in full swing and as Trump and Clinton were looking to defeat their primary challengers and head toward the general election. The messages cover a broad range of political topics and include an exchange of news articles about the race, often alongside their own commentaries. In one exchange, on Oct. 18, 2016, Strzok writes to Page and says: “I am riled up. Trump is an (expletive) idiot, is unable to provide a coherent answer. I CAN’T PULL AWAY. WHAT THE (expletive) HAPPENED TO OUR COUNTRY??!?! A spokesman for Mueller has said Strzok was removed from the team as soon as the text messages were discovered. Nonetheless, Trump and other Republicans have held up the revelation to suggest that members of Mueller’s team, and members of the FBI leadership in general, are politically compromised. FBI Director Chris Wray tacitly rebuked the president at a hearing last week in which he defended his agents. Portuguese star and Real Madrid forward, Cristiano Ronaldo has declared after winning his fifth Ballon D'Or that he is the best player in history of the game. Cristiano Ronaldo says he is the "best player in history" after winning his fifth Ballon d'Or on Thursday, according to a report by SkySports. The Real Madrid forward scooped the award, which is organised by magazine France Football, for the fifth time to tie level with Lionel Messi's tally. "I'm the best player in history, in the good moments and the bad ones," he told France Football. "I respect everyone's preferences, but I've never seen anyone better than me. I have always thought that. No footballer can do the things I can. There's no player more complete than me. "I play well with both feet, I'm quick, powerful, good with the head, I score goals, I make assists. There are guys who prefer Neymar or (Lionel) Messi. But I tell you: there's no-one more complete than me. "No one has won as many individual trophies as me. And I'm not speaking just of the Ballon d'Or. That says something, doesn't it? It's not just a result of the work I do in the gym, like some people think. It's the sum of many things. "Legends like Floyd Mayweather and LeBron James don't get to their perfect level by chance. Many factors coincide. To be at the top and to stay there, you have to have more talent than the others." Ronaldo admitted he was "sad and angry" when Messi scooped the Ballon d'Or on four consecutive occasions from 2009 to 2012, and said he had no interest in going to ceremonies to accept second place. "I won the Ballon d'Or before Messi, then he overtook me and won four in a row. I'm not going to hide from you that I was sad and angry," he said. "I went to the award ceremonies and I never won. At one point, I was even demotivated. I had no desire to go. To be there for the photo didn't interest me. "Then, little by little, thanks to those close to me, I told myself that in life there is a beginning and an end. And in football what counts is the finish, not the start. I was patient. And I won four other Ballon d'Or's."